As producers we often read articles or attend talks on nutrition. These can be very confusing especially when nutritionists start talking about protein. Terms such as Crude Protein, Non-protein nitrogen (NPN), Rumen degradable protein, By-pass Protein, Non degradable protein, escape protein, bacterial protein, true protein….it is just mind boggling and a good enough reason to switch off! Often many of these terms mean the same thing which makes it even more confusing. For those producers that do try and read the odd article on Protein nutrition I’ll will try simplify things as much as possible to try make sense of some of this confusion. Maybe next time someone starts talking about protein or you read an article in the Farmers weekly or Lanbouweekblad it might mean a bit more to you. Let’s start by saying there are protein is one of the 3 three macronutrients: protein, fats and carbohydrates. The sum of the digestible protein, fibre, fats and carbohydrate components of a feedstuff or diet are referred to as the Total Digestible Nutrients (TDN). Proteins are an essential part of all living organisms, especially as structural components of body tissues such as muscle, hair, blood, enzymes and antibodies. Chemically, protein is composed of amino acids, which are organic compounds made of carbon, hydrogen, nitrogen, oxygen or sulfur. Amino acids are the building blocks of proteins, and proteins are the building blocks of muscle mass and other body tissues. How is Protein expressed as part of a feed? The protein content in a feed is often expressed as a % or as g/Kg. The % is the same a g/100g so a feed with Protein content of 15% equates to 150g protein/kg feed. Protein Terms that mean the same thing. What is the Total Protein/Crude Protein (CP)? “Crude protein” is actually a chemical analysis of the food whereby the amount of nitrogen present is used to estimate the amount of protein in the food. This Crude protein (total protein), estimated from measuring the total nitrogen content of the feed, includes Protein Nitrogen and Non Protein Nitrogen (NPN)). 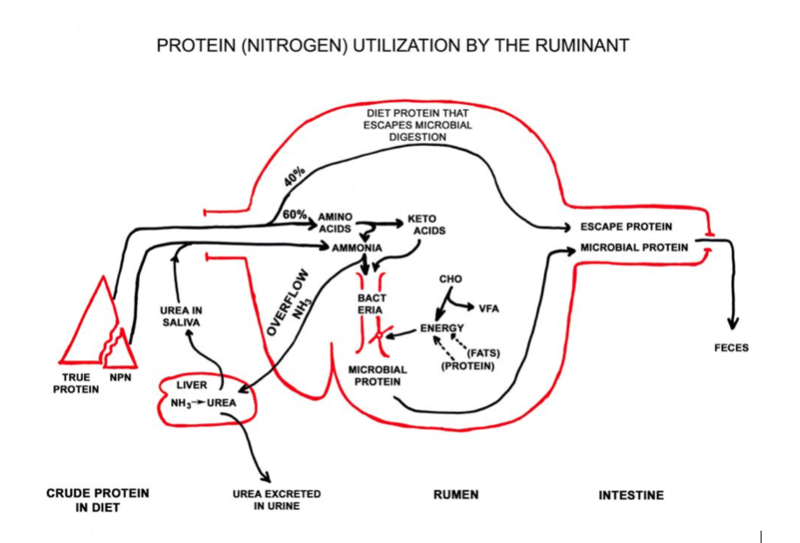 Because N is an integral part of any amino acid, non-protein nitrogen (NPN) has the potential to be utilized for protein synthesis by rumen microorganisms that is why it is included. Following on from the above a True protein is a measure of only the proteins in the feed, whereas crude protein is a measure of all sources of nitrogen and includes non-protein nitrogen, such as urea. What is Rumen Degradable Protein (RDP)? RDP is also known as Degradable Intake Protein (DIP). The DIP or (RDP) represents the portion of crude protein (CP) that can be digested or degraded to ammonia and amino acids in the rumen by microbes. What is Non degradable protein (NDP), By-Pass Protein, Escape Protein? NDP or also called Undigestable Intake Protein UIP is or also called by-pass protein, escape protein or Rumen Undegradable Protein (RUP). By-Pass protein refers to material that is not degraded in the rumen but is degraded in the abomasum and thus is not truly “undegradable.” By-pass Protein is the portion of intake protein that has a slow rate of degradability in the rumen. It is fed so that it may escape digestion in the rumen, reach the lower gastrointestinal (GI) tract essentially intact and be digested directly in the small intestine as it would be in non-ruminants. This can provide a balance of amino acids unaltered by microbial digestion and synthesis. By-pass proteins contain amino acids (a.a) that by-pass the rumen and are absorbed further down the intestinal tract. If microbes break down the a.a in the rumen then body has to rebuild them which is a waste of energy. What is Non-protein Nitrogen (NPN)? Non-Protein-Nitrogen (NPN) is included as NPN sources can be used for protein synthesis. All proteins contain on average 16% Nitrogen (N) whereas urea contains 45% N. Urea is an example of a NPN. In order for urea to be utilized by the rumen microbes it must first be chemically combined with water to form CO2 and ammonia. This reaction is accomplished by action of the enzyme urease derived from certain rumen microbes. Urea is 100% rumen degradable therefore feed with caution and is highly water soluble so protect from rain. What is microbial or bacterial protein? Rumen microbial protein also called bacterial represents a major source of amino acids to the ruminant animal. Microbes living on the feed material and involved in its digestion is continually 'flushed' from the rumen, through the omasum to the abomasum, where they are killed and digested by the cow. The amino acids produced from the digested microbial protein are absorbed through the small intestine. The dried cells of microorganisms (algae, bacteria, actinomycetes and fungi) used as food and feed are collectively known as 'microbial protein'. What are the PROTEIN requirements of an ANGORA GOAT? 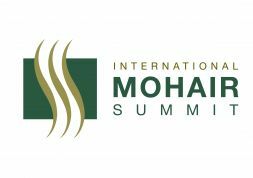 © SA Mohair Growers - 2019 | Links | PROTEIN what do the terms mean?